All text and images on this page are ©2014 by Daniel A. Russell and may not used in other web pages or reports without permission. The content of this page was originally posted on July 23, 1997. The HTML code was modified to be HTML5 compliant on September 12, 2014. The choice of using the plus (+) or minus (-) sign is made according to the convention that if the relative motion of the source and observer is such that they are moving toward each other the perceived frequency (f ´) is higher than the actual frequency (f0). Likewise, if the relative motion of source and observer is such that they are moving away from each other, the perceived frequency (f ´) is lower than the actual frequency (f0). Although first discovered for sound waves, the Doppler effect holds true for all types of waves including light and other electromagnetic waves (though for electromagnetic waves - because of Einstein's theory or relativity - only the relative velocity matters and it is immaterial whether the source or the observer is moving). The Doppler effect for light waves is usually described in terms of colors rather than frequency. A red shift occurs when the source and observer are moving away from eachother, and a blue shift occurs when the source and observer are moving towards eachother. The red shift of light from remote galaxies is proof that the universe is expanding. The animations below will illustrate this phenomena for a moving source of sound waves and stationary observer. The animation at left shows a stationary sound source. Sound waves are produced at a constant frequency f0, and the wavefronts propagate symmetrically away from the source at a constant speed v, which is the speed of sound in the medium. The distance between wavefronts is the wavelength. All observers will hear the same frequency, which will be equal to the actual frequency of the source. For a movie showing how circular waves can be created (in terms of particle motion and wave motion) go here. In the animation at left the same sound source is radiating sound waves at a constant frequency in the same medium. However, now the sound source is moving to the right with a speed vs = 0.7 v (Mach 0.7). The wavefronts are produced with the same frequency as before. However, since the source is moving, the center of each new wavefront is now slightly displaced to the right. As a result, the wavefronts begin to bunch up on the right side (in front of) and spread further apart on the left side (behind) of the source. An observer in front of the source will hear a higher frequency f ´ > f0, and an observer behind the source will hear a lower frequency f ´ < f0. Now the source is moving at the speed of sound in the medium (vs = c, or Mach 1.0). The speed of sound in air at sea level is about 340 m/s or about 750 mph. The wavefronts in front of the source are now all bunched up at the same point. As a result, an observer in front of the source will detect nothing until the source arrives. The pressure front will be quite intense (a shock wave), due to all the wavefronts adding together, and will not be percieved as a pitch but as a "thump" of sound as the pressure wall passes by. The figure at right shows a bullet travelling at Mach 1.01. You can see the shock wave front just ahead of the bullet. Jet pilots flying at Mach 1 report that there is a noticeable "wall" or "barrier" which must be penetrated before achieving supersonic speeds. This "wall" is due to the intense pressure front, and flying within this pressure front produces a very turbulent and bouncy ride. Chuck Yeager was the first person to break the sound barrier when he flew faster than the speed of sound in the X-1 rocket-powered aircraft on October 14, 1947. Check out the movie The Right Stuff for more about this significant milestone, and the beginnings of the US space project. The figure at right shows an F-18 Hornet at the exact instant it goes supersonic. Click on the figure to see more information and a MPEG movie of this event. The sound source has now broken through the sound speed barrier, and is traveling at 1.4 times the speed of sound (Mach 1.4). Since the source is moving faster than the sound waves it creates, it actually leads the advancing wavefront. The sound source will pass by a stationary observer before the observer actually hears the sound it creates. As you watch the animation, notice the clear formation of the Mach cone, the angle of which depends on the ratio of source speed to sound speed. It is this intense pressure front on the Mach cone that causes the shock wave known as a sonic boom as a supersonic aircraft passes overhead. The shock wave advances at the speed of sound v, and since it is built up from all of the combined wave fronts, the sound heard by an observer will be quite intense. 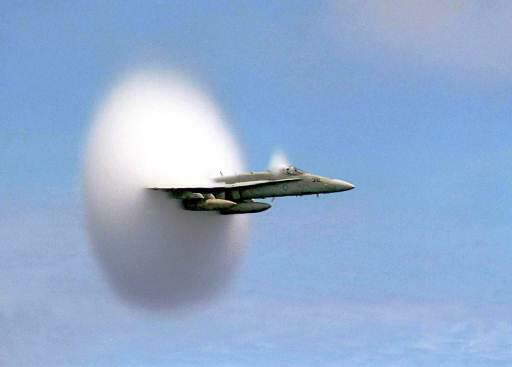 A supersonic aircraft usually produces two sonic booms, one from the aircraft's nose and the other from its tail, resulting in a double thump. The figure at right shows a bullet travelling at Mach 2.45. The mach cone and shock wavefronts are very noticeable. The picture at the left shows the shock wave front generated by a T-38 Talon, a twin-engine, high-altitude, supersonic jet trainer. 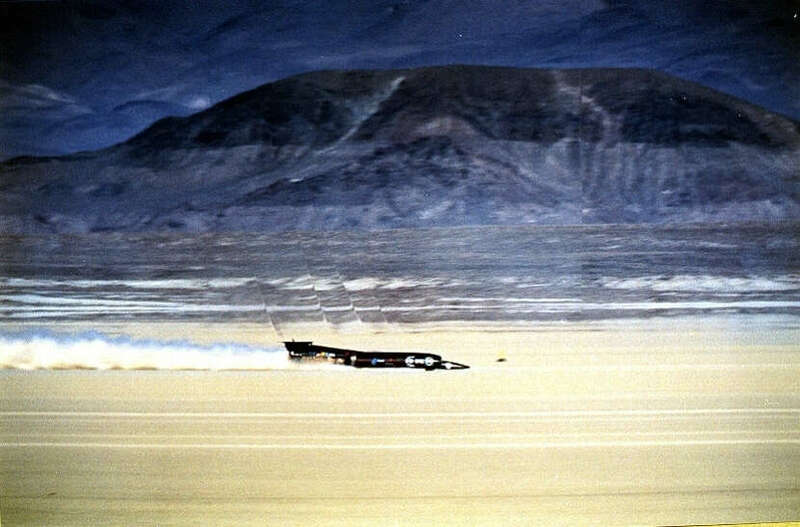 This picture shows a sonic boom created by the THRUST SSC team car as it broke the land speed record (and also broke the sound barrier on land). Click on the image to download a larger version of the image.